Awesome new window treatment technology from our visit to the 2019 IWCE! One of our core values here at 3 Blind Mice is innovation. We attend the International Window Covering Expo (ICWE) each year to stay on top of innovations in the industry to ensure we’re always bringing you the latest & greatest products and ideas on the market! There are thousands in attendance, showing and shopping the latest products, technology, and education in window coverings as well as home décor products and accessories. It’s the premier window coverings expo in the country, and we always leave with new information and new products that we’re excited to share with you! Let’s dive in to this year’s greatest products and innovations. On the left, you’ll see regular shutters with the visible hinges and tilt bar. On the right, the new PerfectTilt shutters with hidden hinges and mechanized tilt. 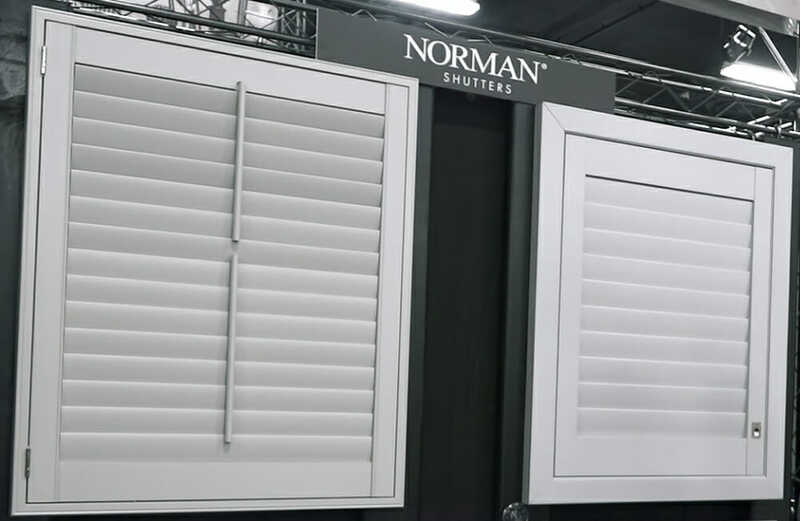 The new PerfectTilt shutters from Norman are all about a clean, streamlined aesthetic. There is no visible tilt bar and the hinges are hidden within the window covering frame. These shutters can be hand-tilted, but even more impressive is the single push-button control! You can open and close these shutters with the push of a single button. There are 8 pre-programmed louver positions for every type of lighting, and they’re battery-operated with Lithium-ion rechargeable batteries which can last up to a year on one charge! You can even extend the battery charge with the included solar panels to power your home’s mechanized window coverings with sustainable, renewable energy. Aside from these technical details, the new PerfectTilt shutters are watching modern interior décor trends closely. Not only do the shutters look very clean and modern, but they’re available in a wide range of colors and finishes, including cool greys which you’ll see becoming more and more popular in current color trends. Perfect for sliding glass doors or double French doors, the Magnaview Honeycomb Vertical Treatment is a classic treatment that’s becoming very popular in recent years. Again, you’ll notice a really clean and modern presentation with the 2-inch wide pleat, both when the treatment is closed and open. The metal head rail at the top is standard but you could also finish these treatments with a wooden valance or a fabric cornice book to coordinate with your home’s décor. It’s really simple to open, requiring just one hand and gliding smoothly into place. When open, the stacking is minimal so you’re getting nearly the full width of your doorway. This makes these vertical treatments a great option as a room divider in a doorway, in addition to covering on exterior doors. A close-up look at the minimal stacking when the Magnaview Honeycomb Vertical Treatment is fully open. 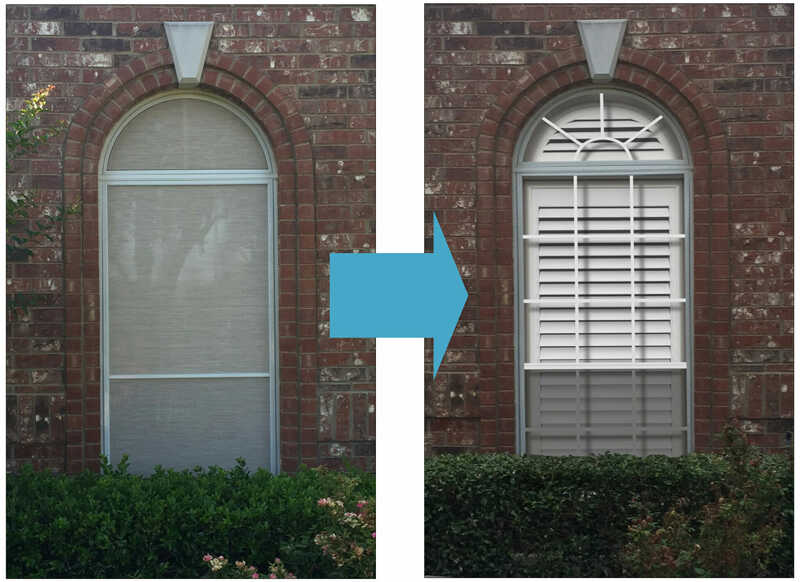 Transform the façade of your home with these Optex Screens which add a unique shutter and French pane look to your windows, regardless of your interior treatment. An absolute must-have for those living in warm climates! These printed exterior screens not only add privacy and a beautiful aesthetic to your home, but they really cut down on the heat let into your home through your windows. There are many specialty shapes available, including full and quarter arches, ovals, octagons, full eyebrow arches, circles, and more. Plus, we can help you choose the grid option that best compliments your home’s exterior. Comfortex has long been a leader in motorized shades, and this year they’re showing a unique top-down bottom-up motorized shade that can be operated simultaneously. This means you can raise or lower the top of your shade at the same time that you raise or lower the bottom. This gives you a nearly unlimited number of shade positions to ensure the ideal privacy and light level for every room in your home. The Simplicity Motor System uses a 14 channel remote which you can use to adjust your shades as well as setting favorite shutter positions. These work with Alexa and Google Home, plus you can install an app on Android and iOS devices to control your motorized window coverings directly from your phone or via smart home voice activation. This is a new innovation that we’re starting to see more and more! 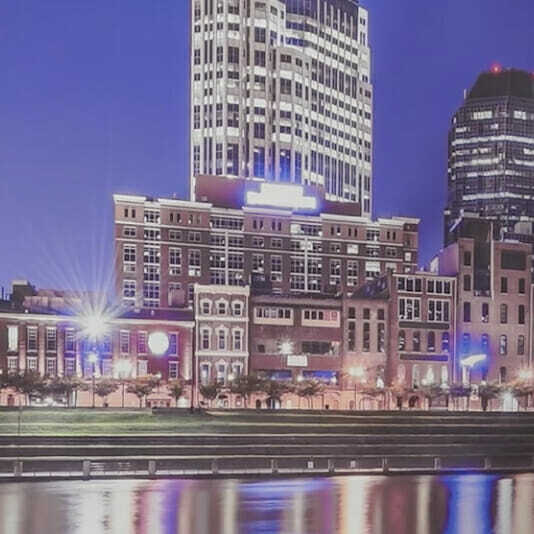 On this example, you can see the vibrant Nashville skyline in honor of this year’s International Window Covering Expo location in Nashville, Tennessee. This photo does a great job of demonstrating the crystal-clear print quality that can be achieved with this new printed roller screen technology—you can see muted neutrals in a range of dark and light, as well as vibrant blues and neon tones. You can customize and print literally anything on these roller shades, whether it’s a favorite photograph, an art print, a specific solid color to match your home décor, or a pattern that matches or compliments your home’s interior. Plus, you can even use this printing technology to add a little something extra to blackout roller shades, which are typically pretty plain in appearance. Detail from our video showing the wide range of colors and detail available with printed screens. Similar to the previous product, here we have an extra-large 18-foot-wide printed shade! Not only can this provide excellent sun protection and privacy for a large space like an outdoor patio, but it can also create a custom backdrop! You can print any photo, texture, or scene of your choosing on these oversized printed roller shades. They’re mechanized with a super-fast and quiet motor and can be controlled by remote. One of the innovations at the 2019 International Window Covering Expo that we’re most excited about is the new Comfortex Color Lux Virtual Design System. This incredible system allows you create a harmonious room based on a selection of 800 colors and dozens of patterns. When you create custom colors and patterns, the finished product is actually printed on your shades, giving you absolute control over customizing your home’s décor! You can use this on cellular shades, roller shades, Roman shades, valances, and side panels for draperies. 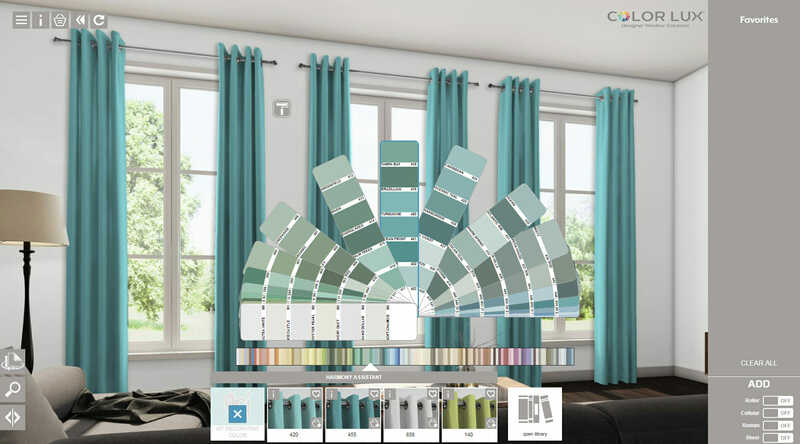 One of the best features of this Comfortex Color Lux Virtual Design System is their online room visualization tool. You can access this online from your own home 24/7 on the Comfortex website. You can explore this incredible tool on your own to try different window treatment styles, patterns, and colors, or a design specialist from 3 Blind Mice can come to your home in a free one-on-one design consultation to walk you through the many customization options! Using the Comfortex Color Lux Virtual Design System is a fun and easy way to see many different window treatment options, colors, and patterns online before you buy! We saw this impressive example of the 800 available Color Lux hues printed on a honeycomb cellular shade display at IWCE 2019. You can select coordinating patterns, colors, and designs with confidence using the Comfortex Color Lux Virtual Design System. It essentially gives you the ability to see unlimited design combinations and find the perfect match for your home before you buy. With nearly unlimited color and pattern options, you’re sure to find the perfect window treatment combination for your home. This is the perfect tool for people with an eye for home décor who want to customize every part of their home. If you’d prefer to have some guidance, we’re happy to schedule a free in-home consultation for you with a 3 Blind Mice design specialist who can outline the best options for your home and provide suggestions on the best window treatment for your home. 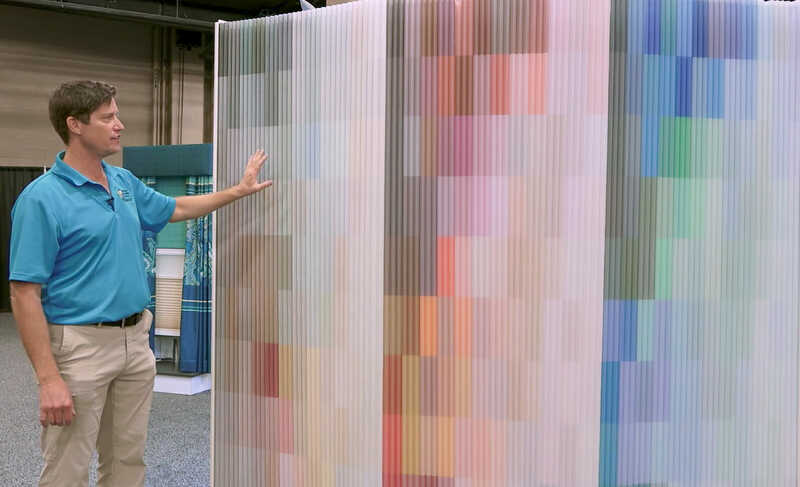 Have questions about any of our Innovations from the 2019 International Window Covering Expo? Contact us online or give us a call at 858-452-6100. We’re always happy to discuss more details and answer your questions. We strive to make the window coverings shopping experience as simple as possible.